Do you find that your computer just isn’t as expeditious as it used to be? Your hard drive may be to blame. Your hard drive is responsible for storing all of the data you have on your computer in a safe and secure location. Over time though, either data can get corrupted or go missing, ultimately causing your hard drive to slow down. Within the Windows operating system is a handy little tool called the Check Disk Utility. Its job is to scan the hard drive to see if there are any damaged sectors or any abnormalities. Because damaged sectors could mean the end of your hard drive and data, it’s important that you run this check at least once or twice a month. The test will bring back results telling you whether or not the test passed or failed. Whenever a new file is created on the hard drive, your computer splits it up into tiny fragments and spreads it across the drive so that it’s easier to access when it needs it. Unfortunately, these scattered bits can sometimes get TOO scattered and you’ll end up with an even slower hard drive than before. 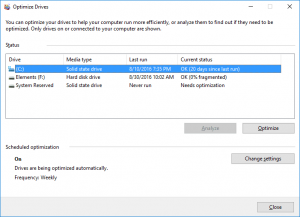 The Disk Defragmenter tool that is found on all Windows PCs helps to organize the data on your hard drive in order to speed up retrieval time. While it isn’t absolutely necessary to run this once a month or so, it sure does help. Another great tool that comes bundled with your operating system is one called Disk Cleanup. It helps get rid of any unwanted files that you have lying around or anything that your system no longer needs. It’s very easy to start up the utility and get rid of useless things that are not only clogging up your hard drive and taking up space, but are also making it more difficult for your hard drive to find what it needs to find. If you still have a slow hard drive or PC after you’ve tried the tips above, chances are it isn’t your hard drive that’s acting up. Instead, you may just have an old computer or other components in your PC aren’t up to modern standards. Consider adding an extra stick of RAM (random access memory) to your motherboard to make your computer faster. Also, if you back up all of your data to an external hard drive, you can wipe your hard drive clean with a fresh installation of your operating system to see if that speeds things up. This is of course a drastic measure to go through, but the results could be very rewarding.